Hi all! And a Very Happy Sweet Stop Sketch Saturday to you too! 8-) Hope you all had a Wonderful week! Mine's been Super busy working a on some Fun projects that I can't quite show you yet, hee hee..8-) They will be posted pretty soon though, and they come with some Really Fun Exciting news too, lol So stay tuned... 8-). Today I'm back with the latest Sweet Stop Sketch Challenge, Yay! 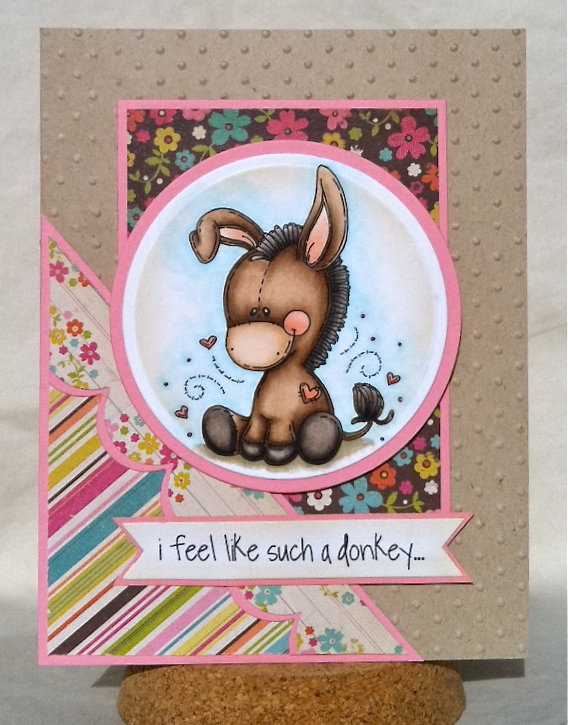 I chose to flip it to accommodate my Sweet Meljen Designs image & computer generated sentiment.. Love this Darling little Donkey and it was just Perfect for my Sweet friends Birthday, though I ended up sending it belated.. 8-( Oh well, I will be more on top of it next year! lol 8-) So without further delay, here's my take on Miss Korin's Fabulous sketch..
And Here's Miss Korin's Awesome Sketch.. I was the lucky recipient of this adorable card! Thankd, Shannon! Your coloring rocks! LOL!! LOVE that sentiment along with this precious image, Shannon! TOO friggin' cute! AAh, I love this sweet Image, and the fun papers! Your colouring is amazing! Fabulous card! Awww that donkey is sooo cute Shannon!! Awesome coloring and fabulous papers! Hope you are enjoying your weekend my friend! Oh what a wonderful card Shannon! the image and sentiment are fab!! you've coloured the image beautifully and I love the scrummy papers and embossing! This little donkey and the sentiment are are just too precious, Shannon...brought a smile to my face first thing this morning! Your coloring is fabulous and I love the colors and papers with the embossed kraft card front. Lucky, Kim, for receiving this cute card, even if it was a little late...I'm sure she loved it! Have a wonderful weekend...try to stay cool! Ha ha! Now that's a fun sentiment and a great way to say I'm sorry! Your card is just adorable, and I love how you flipped the sketch! Wishing you a fantastic weekend! This is just the sweetest card! Love the embossing and your coloring is so spot on!!! Super cute card Shannon. Darling image and fabulous coloring. Love the soft blue around it. Pretty papers too... and I love how you turned the sketch! The scallop border looks great! That donkey image is so adorable and you've colored it beautifully!! Adorable card Shannon! Love the sweet image and darling patterned paper! This card just makes me smile!! Beautifully colored as always and I just love the colors and papers. Have a great week!! Oh, dang, if this isn't the cutest thing! I think he's my new sweetheart. Love what you did with the sketch. What a charmer! Oh how cute??!! Love the sentiment and the pretty papers you used. Awww - what a SWEET little donkey! Adorable work!! !